Charlie Rouse (ts) Thelonious Monk (p) John Ore (b) Frankie Dunlop (d) recorded NYC, November 1-6, 1962. Produced by Teo Macero, Miles Davis’s former producer. Track selection kicks off with Bolivar Blues, in an alternative recording to the Brilliant Corners version with the mysterious missing introduction. It is not “missing” here. Elsewhere there is a connection with the previous post of Dexter Gordon, a version of “Body and Soul”. Monk at the ripe old age of 45 after a long association with Riverside, his first recording for Columbia, a move made after a gap-year touring Europe. Everything flows here, Charlie Rouse knows the score, and Monk’s choice of discordant notes and play with time signatures is altogether more self-assured and matured. The listener by now has “got Monk” and expects the unexpected, even looks forward to it. The Stereo sounds good, to this mono-man. Columbia were obviously very proud of the technology behind their Stereo 360 degree sound, overloading the casual liner-note browser with detail of microphone model numbers and brands of lathes. This was the era of belief in progress through technology, putting man into space – first man Yuri Gagarin in 1961. Technology was something to be proud of, and the future was an exciting place to be, before today’s dystopia-mongers took the future hostage for their own ends. Monk of course is wearing the correct pork-pie hat and the cover artwork is fully compliant with the new music industry guidelines on Non-Smoking Record Covers. It’s worth reading the rear cover 360 degree Stereo technical briefing, if only because it provides a fund of knowledge with which to baffle other collectors at pubs outside record fairs. This entry was posted in Columbia, Thelonius Monk and tagged Charlie Rouse, Columbia, Frankie Dunlop, John Ore, Thelonious Monk by LondonJazzCollector. Bookmark the permalink. Over the years, I have heard different stereo versions of this great session, and it’s good to know that this is what seems to be the “original” stereo mix, with piano in the right channel and drums left. I remember at least one other version, with channels reversed and some reverb added. I am not sure about the track lengths so I would like to know if different takes, even different master tapes might have been involved. Any thoughts anyone? I just noticed the Columbia Matrix code on my copy is a -2#, which I now know means a second master tape mix. Are there -1# matrix copies out there? Do they differ from the label here? Could a 1st and 2nd master tape mix be the source of any variation (instrument placement and added reverb)? Did they make a second mix because the first was deemed not good enough and -1# was scrubbed? 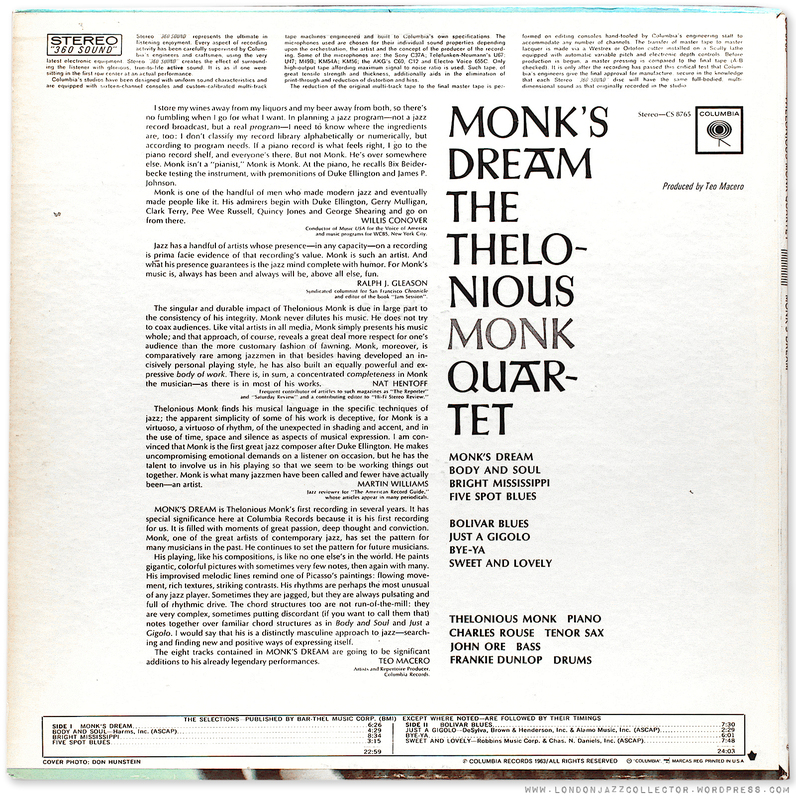 Anyone with a copy of Monk’s Dream, weigh in, please. Just checked my copy (same label as yours) and it’s matrix ends in 2H/2D. 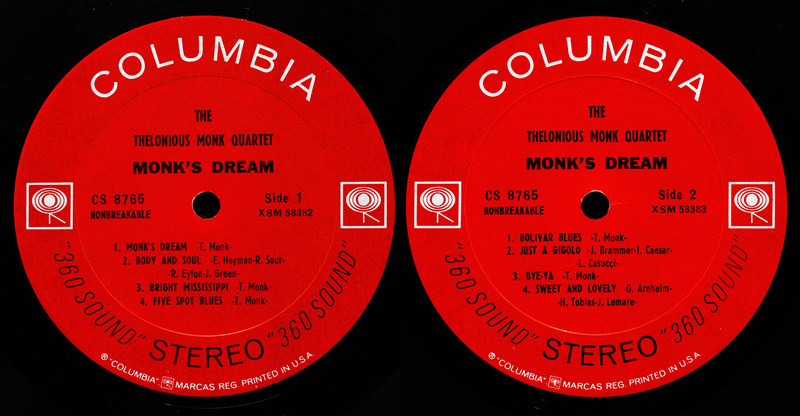 There does exist a very rare six-eye pressing: http://www.popsike.com/Thelonious-Monk-Monks-Dream-IMPOSSIBLE-RAREST-MONK-COLUMBIA-LP-SIX-EYE-MONO/191821176521.html but it must have been one of the last as the WLP is a two eye. Interesting, the six-eye pictured has the CBS overprint, which dates it as 1962/3. Columbia distributed lacquers, like confetti, to several pressing plants. I hazard a guess that one of the plants wasn’t up to speed on the new two eye label design, their local label print supplier carried on using the six-eye CBS overprint template that had been current for a year or two. We have seen this happen before, with Columbia Canada issues. My theory, backed by no evidence, is that the CBS six eye was simply a mistake, quickly corrected, which is why it was “rare”. My guess is that it was pressed at the same time as the other correctly labelled two eyes, not a chronological continuum. Crazy? Me? There are quite a number of uploads on Youtube, some of which represent the reversed channel variation. Understandably, these guys are very reticent about their sources. Hi, i would like to get this records, but I’m not sure whether I should get the mono or stereo version (recently released on Impex). Is the stereo mix well done, as no excessive separation of the instruments like it was done on other recordings like Bob Dylan for instance? I have no special knowledge of modern reissues, so I don’t know Impex or what they “do” in the way of remastering or whatever. Assuming they have gone back to “original tapes” (?) most early Sixties stereo to my ear is not suited to a modern stereo listening environment, where speakers are 10 feet apart. Standing the lead instrument in the left corner of the room doesn’t feel how it should be. I feel happier with mono presentation of these Monk’s, as they allow you to focus on the music rather than where the instruments are sited. However I am aware a lot of LJC visitors have strong views about stereo so you may want to send out for pizza and settle down for the long haul. As I’ve been getting into jazz over the last two years, I’ve put off giving Monk too much of a try, because I thought he was going to be difficult for me. 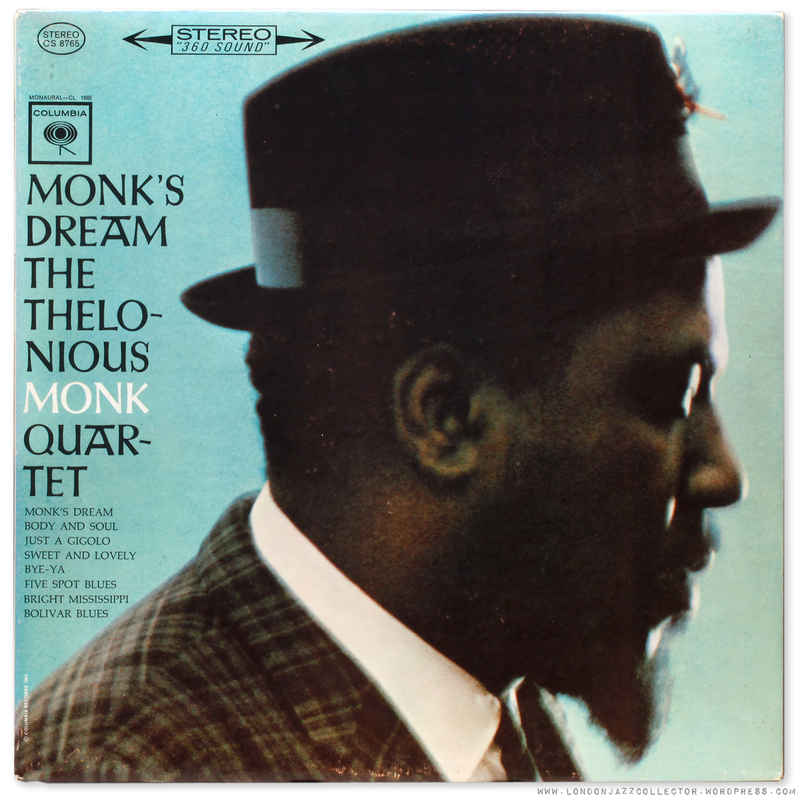 But now that I listen again, especially now that I’m into Andrew Hill, Monk sounds… awesome. Not difficult at all. Of course, every time I listen to one of my Andrew Hill records, it sounds easier than the time before. Of course, Charlie Rouse just sounds great. And I agree about the Columbias. They just did some great recording. I was listening to Mingus “Blues and Roots” today and just thinking about the differences between Atlantic’s recording of that album(yuck) versus Columbia’s recording of “Mingus Ah Um,” which is spooky good, to me at least. Anyway, this Monk sounds great, too, even with the relatively empty center. I’m with you on this Eric. The wider you cast your net, and the more you listen to, what was previously difficult starts to “fit into place”. Jazz is a process of discovery that continues to delight, and amaze. Two different recordings, of course. So not so rare then. Unfortunately my BC has a short but loud scratch precisely across the deleted piano intro. Its like someone knew..
Love the 360 write up on the cover. Especially this bit “Each 360 sound disc will have the same full bodied multi dimensional sound as that originally recorded in the studios”. Note, not “as originally heard in the studio”! Oh, cynical me. Plus, of course, getting the music out of the grooves is much, much harder than getting it into them.